Today I get to tell you about a book that I’ve been waiting on for years. My friend Amanda (founder of the popular blog I am Baker) has just released her new cookbook Surprise-Inside Cakes: Amazing Cakes for Every Occasion–with a Little Something Extra Inside , and I am honored to be one of the first to receive a copy. You’re going to want this book! Surprise! Those “candles” are actually CAKE! There is something for everyone in this colorful, fun book. Imagine cutting into a cake to reveal a hidden surprise! 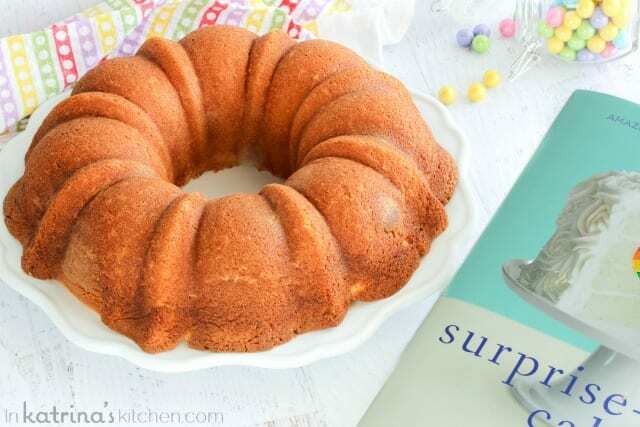 The only thing better than a delicious cake is a delicious cake baked with a surprise inside. Amanda’s cake designs truly are revolutionary! This book takes her designs even further than what you’ve seen on her blog. Use one of her fool-proof cake and frosting recipes, or a box mix, or even your favorite recipe passed down in your family. Filled with full-page, stunning photographs, as well as detailed process shots, Surprise-Inside Cakes takes you through each step to make the perfect surprise-inside cake for your friends and family. I LOVE the process pictures and instructions because I am a visual learner. She gives tips and tricks about how to use everyday objects like cookie cutters, rulers, glass bowls, and container lids to achieve your desired design. Inspired by Amanda I even made my own surprise-inside cake, but you’re going to have to wait until Thursday to see it. I’m serious- once you get Amanda’s book in your hands you will want to bake your own surprise-inside cake! Amanda writes with passion about her craft, and you will surely enjoy getting to know her through her stories and personal anecdotes. I would recommend this book for anyone desiring to do something different in the kitchen. Give it as a gift to the baker in your life, but be warned- you’re going to want to keep a copy for yourself. Lucky for you I have a copy to give away!! 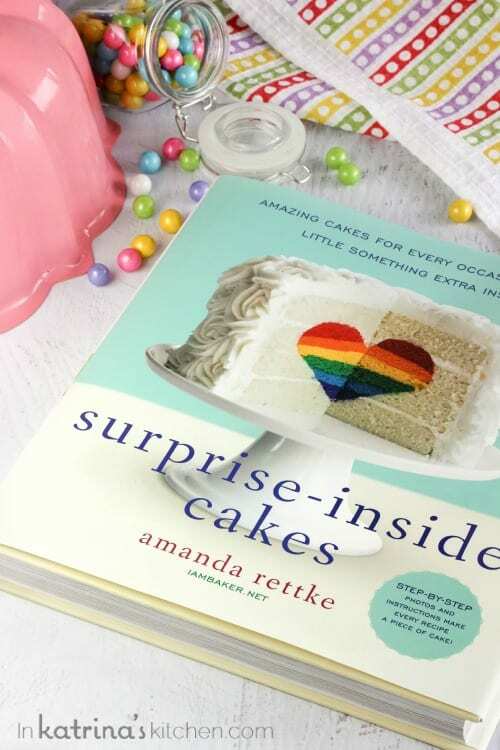 One winner will receive a copy of Surprise-Inside Cakes by Amanda Rettke. Please use the giveaway entry form below and leave a comment on this post to be entered. By entering this giveaway you are agreeing to the Official Rules. This giveaway is a sweepstakes. Open to continental USA residents over age 18. Winner(s) will be chosen by random, announced here, and will be contacted by email. Winner(s) must respond within 48 hours to claim the prize. Disclosure: I was given a copy for review purposes. All opinions expressed are my own. Absolutely beautiful book! Hope I win! So cool! My fingers are crossed. Always wondered how this is done! My mind is so completely blown. I get anxiety baking cupcakes from a box!! That book looks amazing!! 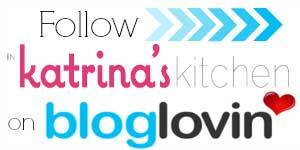 And I can’t wait to see what you did with your cake Katrina! Very cool! Even if I don’t win, I will have to purchase.. such cute cakes! I can’t wait to get my hands on this book! Oh my gosh, finger crossed! I would love to win this it looks amazing!!! Eu quero muito ganhar esse livro maravilhoso! This is one amazing and totally awesome book. Would love to win! They all look so cute but I’m dying over the bunny cake!! So adorable! I would live to make one for my family! 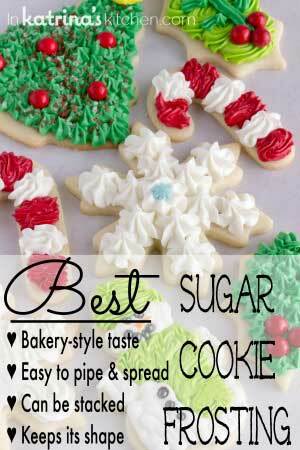 Oh wow I really want to learn how to make all these sweet treats! What an amazing and inspiring book!!! I want to make a cake for everyone I know. It is a beautiful book, I would love a copy. Those pictures make me want to bake a dozen different cakes today! This book is gorgeous and I cannot wait to try my hand at these techniques. I would love to win! Thank you. What a wonderful imagination!! How creative and beautiful!! This book looks awesome!! The cherry design caught my eye, because my last name is cherry and I love all things cherry! These cakes are so fun. I’d make the cherry cake first! Adorable. This book looks so awesome, would love to win! Totally are WOW presentations; hope I win… would love to try to make one or more of these fab-looking cakes. They look good enough on paper to eat! This book looks like so much fun. I love looking at (and making) Amanda’s lovely cakes. I love all of these cakes/recipes, and would love to win the cookbook to try some of these on my own! I’ve made a couple surprise-inside cakes, which were alot of work but everyone loved them. I’d love to read more about this and learn tips and tricks to make the process simpler. Thanks for providing this give-away! This book looks so wonderful! I can’t wait to try one of the cakes. Amanda’s book looks amazing! Thank you for a chance. This has got to be the most creative cake cookbook ever. I would love to win this and make my family their own customized birthday cakes. If I don’t win, I will definitely buy this book!! Oh what a delightful book! I LOVE this book…I WANT it…PLEASE!!! Book is a must have. I hope I get to win this book. Love, Love this Book! Great photos too! Super giveaway! Oh, wow! 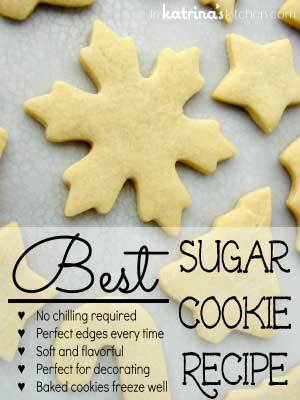 Such a cool idea…would LOVE to make these recipes! All these cakes look amazing! I would love to try to make something like this. I can’t wait to make that Bunny cake for Easter! my children will be so surprised when I cut the cake! I can’t wait until tomorrow, I want to see your cake!! I would have a hard time putting this book down until I had read the entire thing!!! 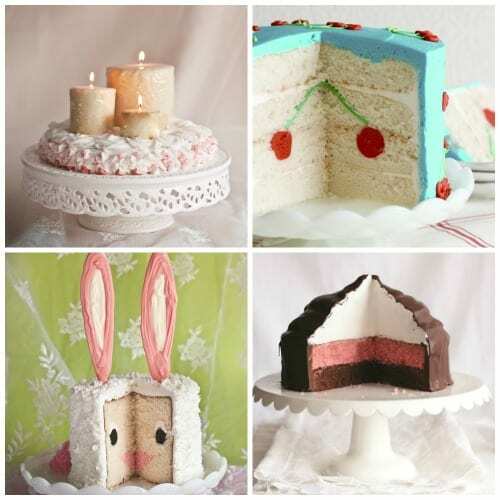 these cakes are so adorable ! i love reading cookbooks, thanks. This is the coolest and I just saw where there will be a Craftsy class too! I am super excited about that!!! I knew this book was coming – so glad that you are offering a copy as a prize! Thank you! This book looks so great! I would love to get my hands on it so I could make wonderful surprises. Thanks for the giveaway! Wow, that is awesome. Would really love to learn how to do those things. Thanks for the opportunity! This is so cool! Can’t wait to see your cake! I love that hidden rainbow heart cake! I would love to win this book. Thanks! Just a beautiful book to own. I love Amanda’s blog and am so excited about this book! Also can’t wait to see what you made! I’ve been following Amanda’s blog for quite awhile and think her work with cakes is awesome. Would love to win. Fun! I’d love to make fun surprise cakes! Really hope I win! Looks so fun! Wow, what a great idea for a book! I’m excited to get a copy! A surprise in every cake! These cakes are beautiful Truly amazing. This would be great for Grandkids cakes. 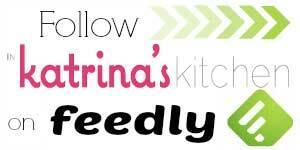 Since I’m expecting my FIRST GRANDBABY soon, this is perfect time to try to win this cookbook! Good luck to everyone who is entered! Lovely cake to try for springtime! Love all the cakes I’ve seen from this book! What a great giveaway! Cant wait to get it! It all looks sooo cool! I would love to have this book… Fingers crossed. Love that she encourages you to use your own recipes. Can’t wait to try it out and surprise my little boys! For some reason my comment didn’t show what I wrote! Everyone keeps saying how amazing and unique this book is and it would be great if I can join the convos! This book is definitely something I would like to add to my collection, I would love to try to bake the cakes inside! These really are easier that one would think! And you can wow all your friends. This book looks fabulous – I love baking and make cakes for all our family events. I would love to know how to bake these marvels! Thank you so much for the opportunity! ooooohhh… such a pretty book! Got my fingers crossed! I would love to bake these cakes for my grands and friends. They= grands would love them. I really want to make surprise cakes but I haven’t gotten up the courage yet! Hope its as easy to do as it is fun to look at! I hope to get the pleasure of reading ur fun beautiful book. I would love to let my inner baker out! Have had fun following you on this site. And now a chance to win the festive baking book….Thanks. would love to win this book= so cool!!!! This book looks so neat – and I really like that it has lots of pictures and details. This book looks amazing. I can just imagine bringing one of those cakes into work for someone’s birthday and blowing them away. I’m in awe of the artistic ability and the book is beautiful. I love to bake, but most of my cakes taste better than they look – I am inspired by this book and can’t wait to try to make such happy and cute cakes!!! Love this book-it makes me happy just looking at it! Looks like even I could do these! OMG! This book looks so fun! That bunny cake would be so great to make for Easter! Wow! This looks like such a fun book. Can’t wait to try one! I’m looking forward to getting my hands on this book!! Love it! So excited to try out a new adventure. Can’t wait to start! 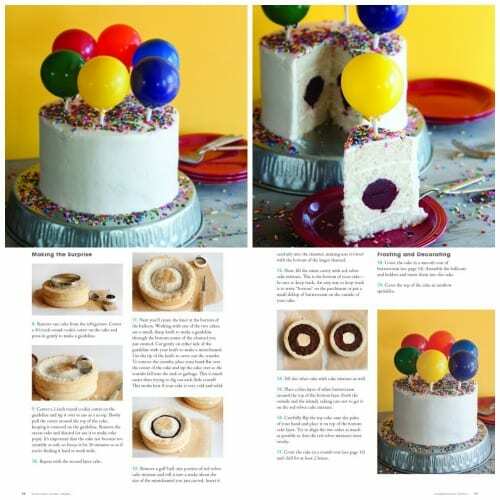 What a fun idea….what great cakes I could bake with a copy of this book. What a great book, hope I win! I love challenging myself with bigger & better cakes so having this book would really help. I LOVE the bunny one! Hopefully I win so that I have the instructions in time for Easter…..
Looks like such a fun book. 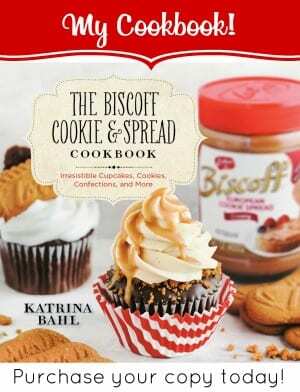 I would LOOOOOOOOOOOVE to win this cookbook!!!!! What a beautiful book! Fingers crossed! Looks like a great book to try new things. How fun! 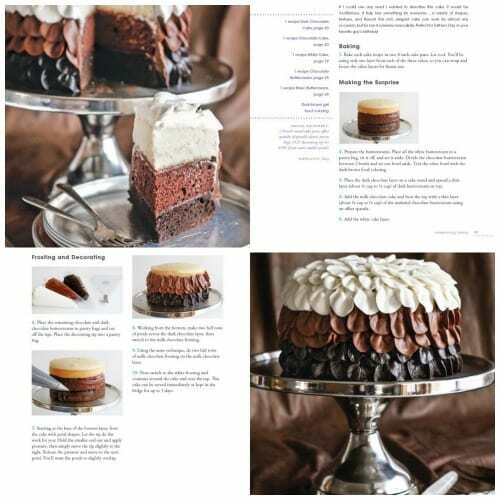 Would love to win this awesome cookbook so I can learn to make these cakes! I love the ideas that have already started flowing just from the taste of this book. It’s sure to be a hit! How wonderful for you to have been able to review it. 🙂 Best of luck to all of us. The second best option is to ransack the seller to buy our copies. LOL We’ll all be baking Surprise Inside Cakes in no time, what a wonderful idea. Thanks for sharing! These designs are so fascinating and would be a lot of fun to present to guests. I recently started baking from scratch and would love to read this book. The cover photo is awesome! These recipes look fantastic! Hope I will be able to try them out!